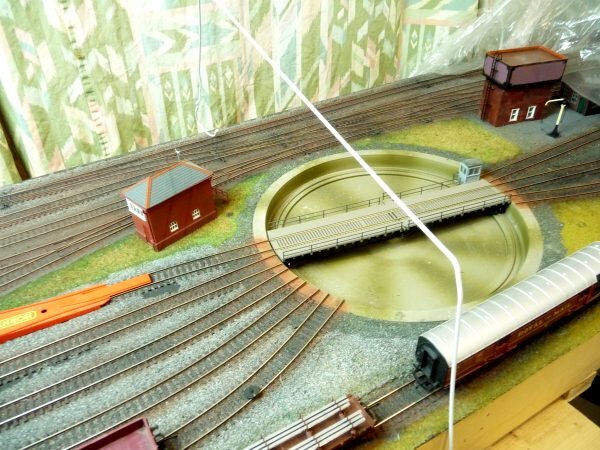 A guide to cover your layout safely without damage and protect from dust! Source:- Decorating suppliers, Chain stores, Wilko, Pound shops, Screwfix. Buy the CHEAPEST dust sheet you can! The cheaper it is, the thinner it is! We all know what a bind keeping the track clean is, but how about eliminating the need? This won’t stop dirt accumulating while you run the layout, but it will eliminate the collection of dust for the other 90% of the time. Just think how many hours a day the layout is exposed when your not there! It would be great to seal it in an air tight cabinet, or just covered with some sheeting, but both of these are impracticable. Throwing a tarp over the layout and crushing all your hard work and scraping all the delicate posts and people off when you pull the sheet off, is no joke. But what if the sheet was as light as tissue paper? How about putting a frame over the layout for the sheet to rest on? 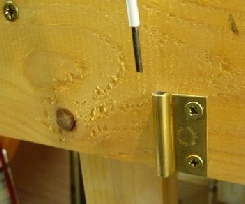 Use a pin punch (or nail) to knock out the pins from the hinges. Fix to the side of the front of the layout approximately ever 2ft (600mm). 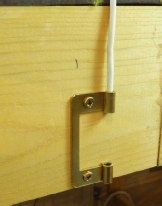 Either use the hook as a landing point, or if the other side is accessible, use another hinge socket, if its a wall, simply drill a small hole in line with the front socket. Untwist the coat hanger and straighten the two tight bends, cut the spiral off the straight end. If your not using the hook end as a landing leg, straighten it out. You will need some tough pliers/cutters to cut the wire, if it is beyond those that you have, cut the wire with a Dremel disk or a junior/hacksaw. Some sheets are 9 feet wide, others are 12 feet square. You can cut in half, but don’t get carried away, leave a few feet spare more than the width of the layout, as its needed to give ‘weight’ over the edge to naturally pull the top taught. 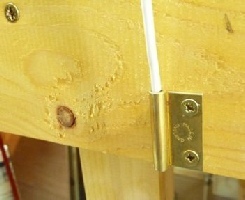 If the wire does not suit you, an alternative is to use a copper tube elbow fixed to a wall, you can then insert a copper pipe or round wooden dowel in the end sticking out from the wall and it will self support. 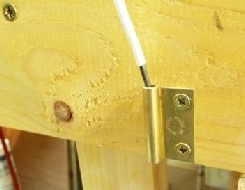 A deep wooden block with a hole drilled in it the same size as a dowel would also work.